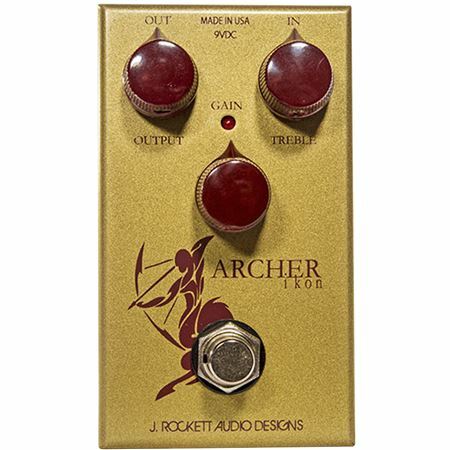 Shop J Rockett Audio Archer Ikon OD and Boost Pedal from AMS with 0% Interest Payment Plans and Free Shipping. Very great box. Does exactly what I need it to do. Sound great! One of my new FAVORITE DRIVES! This pedal is very versatile drive pedal. I could easily see 2 of these on my board. As a clean boost, it works very well and creates a very smooth creamy tone, but when the drive gets set above 10 oclock, you start to see some crunch added in. Around 12 and above, you hit some serious overdrive/distortion. This replaced a Tumnus Deluxe, which is also a great pedal, but it did pretty much what my tubescreamer did, but this pedal stands out! I've used this for Rhythm and Lead guitar with many different guitars and it works well with gain around 11am-1pm, level around 12, and treble around 12. I get lots of compliments on my tone and I'm glad I purchased this. This pedal is everything and more of what I was hoping for. Perfect. Absolutely love it. Really great sound! Can be very subtle while adding an incredible tone, or you can crank up the drive. I have used all kinds of overdrive pedals from Boss to Boutique and the Ikon blows them all out of the water. A really great overdrive for low gain settings to fatten your sound and also has a very nice lead high gain tone as well with just enough compression. If you are on the fence...go ahead and get one...you won't regret it. IMO, greatest clean boost there is and excellent for pushing your amp into the "hot" zone or for driving another od pedal! Like it says start with the gain all the way down and level up and work from there. There are several "sweet" spots.